This article is about the capital of Ireland. For other uses, see Dublin (disambiguation). "Áth Cliath" redirects here. For the village in Scotland, see Hurlford. Dublin (/ˈdʌblɪn/, locally /ˈdʊb-/ or /ˈdɔːblɛn/; Irish: Baile Átha Cliath [ˈbˠalʲə aːhə ˈclʲiə; ˌbʲlʲaː ˈclʲiə]) is the capital and largest city of Ireland. It is on the east coast of Ireland, in the province of Leinster, at the mouth of the River Liffey, and is bordered on the south by the Wicklow Mountains. It has an urban area population of 1,173,179, while the population of the Dublin Region (formerly County Dublin), as of 2016[update], was 1,347,359, and the population of the Greater Dublin area was 1,904,806. There is archaeological debate regarding precisely where Dublin was established by the Gaels in or before the 7th century AD. Later expanded as a Viking settlement, the Kingdom of Dublin, the city became Ireland's principal settlement following the Norman invasion. The city expanded rapidly from the 17th century and was briefly the second largest city in the British Empire before the Acts of Union in 1800. Following the partition of Ireland in 1922, Dublin became the capital of the Irish Free State, later renamed Ireland. Dublin is a historical and contemporary centre for education, the arts, administration and industry. As of 2018[update] the city was listed by the Globalization and World Cities Research Network (GaWC) as a global city, with a ranking of "Alpha −", which places it amongst the top thirty cities in the world. The name Dublin comes from the Irish word Dubhlinn, early Classical Irish Dubhlind/Duibhlind, from dubh ([d̪uβ], [d̪uw], [d̪uː]) meaning "black, dark", and lind ([lʲiɲ(d̪ʲ)]) "pool", referring to a dark tidal pool. This tidal pool was located where the River Poddle entered the Liffey, on the site of the castle gardens at the rear of Dublin Castle. In Modern Irish the name is Duibhlinn, and Irish rhymes from County Dublin show that in Dublin Leinster Irish it was pronounced Duílinn [ˈd̪ˠiːlʲiɲ]. The original pronunciation is preserved in the names for the city in other languages such as Old English Difelin, Old Norse Dyflin, modern Icelandic Dyflinn and modern Manx Divlyn as well as Welsh Dulyn. Other localities in Ireland also bear the name Duibhlinn, variously anglicised as Devlin, Divlin and Difflin. Historically, scribes using the Gaelic script wrote bh with a dot over the b, rendering Duḃlinn or Duiḃlinn. Those without knowledge of Irish omitted the dot, spelling the name as Dublin. Variations on the name are also found in traditionally Gaelic-speaking areas of Scotland (Gàidhealtachd, cognate with Irish Gaeltacht), such as An Linne Dhubh ("the black pool"), which is part of Loch Linnhe. It is now thought that the Viking settlement was preceded by a Christian ecclesiastical settlement known as Duibhlinn, from which Dyflin took its name. Beginning in the 9th and 10th century, there were two settlements where the modern city stands. The Viking settlement of about 841, Dyflin, and a Gaelic settlement, Áth Cliath ("ford of hurdles") further up river, at the present day Father Mathew Bridge (also known as Dublin Bridge), at the bottom of Church Street. Baile Átha Cliath, meaning "town of the hurdled ford", is the common name for the city in modern Irish. Áth Cliath is a place name referring to a fording point of the River Liffey near Father Mathew Bridge. Baile Átha Cliath was an early Christian monastery, believed to have been in the area of Aungier Street, currently occupied by Whitefriar Street Carmelite Church. There are other towns of the same name, such as Àth Cliath in East Ayrshire, Scotland, which is anglicised as Hurlford. 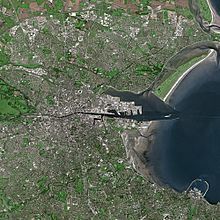 The area of Dublin Bay has been inhabited by humans since prehistoric times, but the writings of Ptolemy (the Greco-Roman astronomer and cartographer) in about AD 140 provide possibly the earliest reference to a settlement there. He called it Eblana polis (Greek: Ἔβλανα πόλις). Dublin celebrated its 'official' millennium in 1988, meaning the Irish government recognised 988 as the year in which the city was settled and that this first settlement would later become the city of Dublin. It is now thought the Viking settlement of about 841 was preceded by a Christian ecclesiastical settlement known as Duibhlinn, from which Dyflin took its name. Beginning in the 9th and 10th century, there were two settlements which later became the modern Dublin. The subsequent Scandinavian settlement centred on the River Poddle, a tributary of the Liffey in an area now known as Wood Quay. The Dubhlinn was a pool on the lowest stretch of the Poddle, used to moor ships. This pool was finally fully infilled during the early 18th century, as the city grew. The Dubhlinn lay where the Castle Garden is now located, opposite the Chester Beatty Library within Dublin Castle. Táin Bó Cuailgne ("The Cattle Raid of Cooley") refers to Dublind rissa ratter Áth Cliath, meaning "Dublin, which is called Ath Cliath". Dublin was established as a Viking settlement in the 10th century and, despite a number of attacks by the native Irish, it remained largely under Viking control until the Norman invasion of Ireland was launched from Wales in 1169. It was upon the death of Muirchertach Mac Lochlainn in early 1166 that Ruaidrí Ua Conchobair, King of Connacht, proceeded to Dublin and was inaugurated King of Ireland without opposition. According to some historians, part of the city's early economic growth is attributed to a trade in slaves. Slavery in Ireland and Dublin reached its pinnacle in the 9th and 10th centuries. Prisoners from slave raids and kidnappings, which captured men, women and children, brought revenue to the Gaelic Irish Sea raiders, as well as to the Vikings who had initiated the practice. The victims came from Wales, England, Normandy and beyond. The King of Leinster, Diarmait Mac Murchada, after his exile by Ruaidhrí, enlisted the help of Strongbow, the Earl of Pembroke, to conquer Dublin. Following Mac Murrough's death, Strongbow declared himself King of Leinster after gaining control of the city. In response to Strongbow's successful invasion, King Henry II of England affirmed his ultimate sovereignty by mounting a larger invasion in 1171 and pronounced himself Lord of Ireland. Around this time, the county of the City of Dublin was established along with certain liberties adjacent to the city proper. This continued down to 1840 when the barony of Dublin City was separated from the barony of Dublin. Since 2001, both baronies have been redesignated as the City of Dublin. The city had a population of 21,000 in 1640 before a plague in 1649–51 wiped out almost half of the city's inhabitants. However, the city prospered again soon after as a result of the wool and linen trade with England, reaching a population of over 50,000 in 1700. As the city continued to prosper during the 18th century, Georgian Dublin became, for a short period, the second largest city of the British Empire and the fifth largest city in Europe, with the population exceeding 130,000. The vast majority of Dublin's most notable architecture dates from this period – the Four Courts, the Custom House, Temple Bar and Grafton Street are some of the few remaining areas that were not affected by the wave of Georgian reconstruction and maintained their medieval character. Dublin grew even more dramatically during the 18th century, with the construction of many new districts and buildings, such as Merrion Square, Parliament House and the Royal Exchange. The Wide Streets Commission was established in 1757 at the request of Dublin Corporation to govern architectural standards on the layout of streets, bridges and buildings. In 1759, the Guinness brewery was founded; and would eventually grow to become the largest brewery in the world and the largest employer in Dublin. Dublin was also a victim of the Northern Irish Troubles, although during this 30 year conflict, violence mainly occurred within Northern Ireland. However, the Provisional IRA drew some support from within the Republic, including from Dublin. A Loyalist paramilitary group, the Ulster Volunteer Force, bombed the city during this time – notably in an atrocity known as the Dublin and Monaghan bombings in which 34 people died, mainly in central Dublin. Since 1997, the landscape of Dublin has changed. The city was at the forefront of Ireland's economic expansion during the Celtic Tiger period, with private sector and state development of housing, transport and business. Following an economic decline during the Great Recession, Dublin has rebounded and as of 2017[update] has close to full employment, but a significant problem with housing supply in both city and surrounds. From 1842, the boundaries of the city were comprehended by the baronies of Dublin City and the Barony of Dublin. In 1930, the boundaries were extended by the Local Government (Dublin) Act. Later, in 1953, the boundaries were again extended by the Local Government Provisional Order Confirmation Act. Dublin City Council is a unicameral assembly of 63 members elected every five years from Local Election Areas. It is presided over by the Lord Mayor, who is elected for a yearly term and resides in Dublin's Mansion House. Council meetings occur at Dublin City Hall, while most of its administrative activities are based in the Civic Offices on Wood Quay. The party or coalition of parties with the majority of seats assigns committee members, introduces policies, and proposes the Lord Mayor. The Council passes an annual budget for spending on areas such as housing, traffic management, refuse, drainage, and planning. The Dublin City Manager is responsible for implementing City Council decisions but also has considerable executive power. Government Buildings house the Department of the Taoiseach, the Council Chamber, the Department of Finance and the Office of the Attorney General. It consists of a main building (completed 1911) with two wings (completed 1921). It was designed by Thomas Manley Dean and Sir Aston Webb as the Royal College of Science. The First Dáil originally met in the Mansion House in 1919. The Irish Free State government took over the two wings of the building to serve as a temporary home for some ministries, while the central building became the College of Technology until 1989. 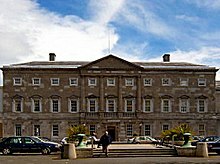 Although both it and Leinster House were intended to be temporary locations, they became the permanent homes of parliament from then on. For elections to Dáil Éireann, the city is divided into five constituencies: Dublin Central (3 seats), Dublin Bay North (5 seats), Dublin North-West (3 seats), Dublin South-Central (4 seats) and Dublin Bay South (4 seats). Nineteen TD's are elected in total. In the 2016 general election the Dublin Region elected 14 Fine Gael, 7 Sinn Féin, 6 Fianna Fáil, 3 People Before Profit, 2 Socialist Party, 2 Labour Party, 2 Green Party, 1 Social Democrats and 7 Independent TDs. Dublin is situated at the mouth of the River Liffey and encompasses a land area of approximately 115 square kilometres (44 sq mi) in east-central Ireland. It is bordered by the Dublin Mountains, a low mountain range and sub range of the Wicklow Mountains, to the south and surrounded by flat farmland to the north and west. A north-south division once, to some extent, traditionally existed, with the River Liffey as the divider. The Northside was generally seen as working class to middle class, while the Southside was seen as middle class to upper-middle class, although containing "pockets" of working class life. There have also been some social divisions evident between the coastal suburbs in the east of the city, and the newer developments further to the west. In some tourism and real-estate marketing contexts, inner Dublin is sometimes divided into a number of "quarters" or districts. These include, the 'Medieval Quarter' (in the area of Dublin Castle, Christ Church and St Patrick's Cathedral and the old city walls), the 'Georgian Quarter' (including the area around St Stephen's Green, Trinity College, and Merrion Square), the 'Docklands Quarter' (around the Dublin Docklands and Silicon Docks), the 'Cultural Quarter' (around Temple Bar), and 'Creative Quarter' (between South William Street and George's Street). Dublin's sheltered location on the east coast makes it the driest place in Ireland, receiving only about half the rainfall of the west coast. Ringsend in the south of the city records the lowest rainfall in the country, with an average annual precipitation of 683 mm (27 in), with the average annual precipitation in the city centre being 714 mm (28 in). The main precipitation in winter is rain; however snow showers do occur between November and March. Hail is more common than snow. The city experiences long summer days and short winter days. Strong Atlantic winds are most common in autumn. These winds can affect Dublin, but due to its easterly location, it is least affected compared to other parts of the country. However, in winter, easterly winds render the city colder and more prone to snow showers. In the 20th century, smog and air-pollution were an issue in the city, precipitating a ban on bituminous fuels across Dublin. The ban was implemented in 1990 to address black smoke concentrations, that had been linked to cardiovascular and respiratory deaths in residents. Since the ban, non-trauma death rates, respiratory death rates and cardiovascular death rates have declined – by an estimated 350 deaths annually. One of Dublin's newest monuments is the Spire of Dublin, officially entitled the "Monument of Light." It is a 121.2-metre (398 ft) conical spire made of stainless steel, located on O'Connell Street where it meets Henry Street and North Earl Street. It replaces Nelson's Pillar and is intended to mark Dublin's place in the 21st century. The spire was designed by Ian Ritchie Architects, who sought an "Elegant and dynamic simplicity bridging art and technology". The base of the monument is lit and the top is illuminated to provide a beacon in the night sky across the city. 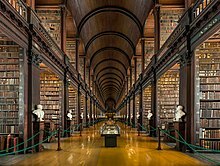 The Old Library of Trinity College, Dublin, holding the Book of Kells, is one of the city's most visited sites. 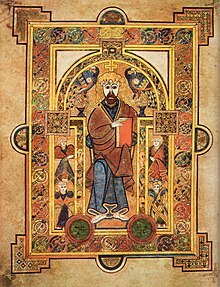 The Book of Kells is an illustrated manuscript created by Irish monks circa 800 AD. The Ha'penny Bridge, an iron footbridge over the River Liffey, is one of the most photographed sights in Dublin and is considered to be one of Dublin's most iconic landmarks. Other landmarks and monuments include Christ Church Cathedral and St Patrick's Cathedral, the Mansion House, the Molly Malone statue, the complex of buildings around Leinster House, including part of the National Museum of Ireland and the National Library of Ireland, The Custom House and Áras an Uachtaráin. Other sights include the Anna Livia monument. The Poolbeg Towers are also landmark features of Dublin, and visible from various spots around the city. There are many green-spaces around the city, and Dublin City Council manages over 1,500 hectares (3,700 acres) of parks. Public parks include the Phoenix Park, Herbert Park, St Stephen's Green, Saint Anne's Park and Bull Island. The Phoenix Park is about 3 km (2 miles) west of the city centre, north of the River Liffey. Its 16-kilometre (10 mi) perimeter wall encloses 707 hectares (1,750 acres), making it one of the largest walled city parks in Europe. It includes large areas of grassland and tree-lined avenues, and since the 17th century has been home to a herd of wild Fallow deer. The residence of the President of Ireland (Áras an Uachtaráin), which was built in 1751, is located in the park. The park is also home to Dublin Zoo, Ashtown Castle, and the official residence of the United States Ambassador. Music concerts are also sometimes held in the park. St Stephen's Green is adjacent to one of Dublin's main shopping streets, Grafton Street, and to a shopping centre named for it, while on its surrounding streets are the offices of a number of public bodies. Saint Anne's Park is a public park and recreational facility, shared between Raheny and Clontarf, both suburbs on the Northside. The park, the second largest municipal park in Dublin, is part of a former 2-square-kilometre (0.8 sq mi; 500-acre) estate assembled by members of the Guinness family, beginning with Benjamin Lee Guinness in 1835 (the largest municipal park is nearby (North) Bull Island, also shared between Clontarf and Raheny), featuring a 5 km beach. The Dublin region is the economic centre of Ireland, and was at the forefront of the country's economic expansion during the Celtic Tiger period. In 2009, Dublin was listed as the fourth richest city in the world by purchasing power and 10th richest by personal income. According to Mercer's 2011 Worldwide Cost of Living Survey, Dublin is the 13th most expensive city in the European Union (down from 10th in 2010) and the 58th most expensive place to live in the world (down from 42nd in 2010). As of 2017[update], approximately 874,400 people were employed in the Greater Dublin Area. Around 60% of people who are employed in Ireland's financial, ICT, and professional sectors are located in this area. A number of Dublin's traditional industries, such as food processing, textile manufacturing, brewing, and distilling have gradually declined, although Guinness has been brewed at the St. James's Gate Brewery since 1759. Economic improvements in the 1990s attracted a number of global pharmaceutical, information and communications technology companies to the city and Greater Dublin Area. Companies such as Microsoft, Google, Amazon, eBay, PayPal, Yahoo!, Facebook, Twitter, Accenture and Pfizer now have European headquarters and/or operational bases in the city, with several located in enterprise clusters like the Digital Hub and Silicon Docks. This presence of these companies has driven economic expansion in the city and led to Dublin sometimes being referred to as the "Tech Capital of Europe". Financial services have also become important to the city since the establishment of Dublin's International Financial Services Centre in 1987. More than 500 operations are approved to trade under the IFSC programme. The centre is host to half of the world's top 50 banks and to half of the top 20 insurance companies. Many international firms have established major headquarters in the city, such as Citibank. The Irish Stock Exchange (ISEQ), Internet Neutral Exchange (INEX) and Irish Enterprise Exchange (IEX) are also located in Dublin. Dublin has been positioned as one of the main cities vying to host Financial Services companies hoping to retain access to the Eurozone after Brexit. The Celtic Tiger also led to a temporary boom in construction, with large redevelopment projects in the Dublin Docklands and Spencer Dock. Completed projects include the Convention Centre, the 3Arena, and the Bord Gáis Energy Theatre. In the second quarter of 2018, Dublin touched its lowest unemployment rate in a decade, when it fell down to 5.7% as reported by the Dublin Economic Monitor. The road network in Ireland is primarily focused on Dublin. The M50 motorway, a semi-ring road which runs around the south, west and north of the city, connects important national primary routes to the rest of the country. In 2008, the West-Link toll bridge was replaced by the eFlow barrier-free tolling system, with a three-tiered charge system based on electronic tags and car pre-registration. The 2016 TomTom Traffic Index ranked Dublin the 15th most congested city in the world and the 7th most congested in Europe. Dublin is served by a network of nearly 200 bus routes which cover the city and suburbs. The majority of these are provided by Dublin Bus, with a modest number having been transferred to Go Ahead Ireland in 2018, but a number of smaller companies also operate. Fares are generally calculated on a stage system based on distance travelled. There are several different levels of fares, which apply on most services. A "Real Time Passenger Information" system was introduced at Dublin Bus bus stops in 2012. Electronically displayed signs relay information about the time of the next bus' arrival based on its GPS determined position. The National Transport Authority is responsible for integration of bus and rail services in Dublin and has been involved in introducing a pre-paid smart card, called a Leap card, which can be used on all of Dublin's public transport services. The 2011 Census showed that 5.9 percent of commuters in Dublin cycled. A 2013 report by Dublin City Council on traffic flows crossing the canals in and out of the city found that just under 10% of all traffic was made up of cyclists, representing an increase of 14.1% over 2012 and an 87.2% increase over 2006 levels and is attributed to measures, such as, the Dublinbikes bike rental scheme, the provision of cycle lanes, public awareness campaigns to promote cycling and the introduction of the 30kph city centre speed limit. Dublin City Council began installing cycle lanes and tracks throughout the city in the 1990s, and as of 2012[update] the city had over 200 kilometres (120 mi) of specific on- and off-road tracks for cyclists. In 2011, the city was ranked 9th of major world cities on the Copenhagenize Index of Bicycle-Friendly Cities. The same index showed a fall to 15th in 2015, and Dublin was outside the top 20 in 2017. Dublinbikes is a self-service bicycle rental scheme which has been in operation in Dublin since 2009. Sponsored by JCDecaux and Just Eat, the scheme consists of hundreds of unisex bicycles stationed at 44 terminals throughout the city centre. Users must make a subscription for either an annual Long Term Hire Card or purchase a three-day ticket. As of 2018[update], Dublinbikes had over 66,000 long-term subscribers making over 2 million journeys per year. Heuston and Connolly stations are the two main railway stations in Dublin. Operated by Iarnród Éireann, the Dublin Suburban Rail network consists of five railway lines serving the Greater Dublin Area and commuter towns such as Drogheda and Dundalk in County Louth. One of these lines is the electrified Dublin Area Rapid Transit (DART) line, which runs primarily along the coast of Dublin, comprising 31 stations, from Malahide and Howth southwards as far as Greystones in County Wicklow. Commuter rail operates on the other four lines using Irish Rail diesel multiple units. In 2013, passengers for DART and Dublin Suburban lines were 16 million and 11.7 million, respectively (around 75% of all Irish Rail passengers). Dublin once had an extensive system of trams but this was largely phased out by 1949. A new light rail system, often described as a tram system, the Luas, was launched in 2004, and is run by Transdev Ireland (under contract from Transport Infrastructure Ireland), carrying over 34 million passengers annually. The network consists of two interconnecting tram lines; the Red Line links the Docklands and city centre with the south-western suburbs of Tallaght and Saggart, while the Green Line connects northern inner city suburbs and the main city centre with suburbs to the south of the city including Sandyford and Brides Glen. Together these lines comprise a total 67 stations and 44.5 kilometres (27.7 mi) of track. Construction of a 6 km extension to the Green Line, bringing it into the north of the city, commenced in June 2013 and was opened for passenger travel on December 9, 2017. A metro service is proposed under the name of Metrolink, and planned to run from Dublin's northside to Sandyford via Dublin Airport and St. Stephen's Green, with construction projected to start after 2021. Dublin Connolly is connected by bus to Dublin Port and ferries run by Irish Ferries and Stena Line to Holyhead for connecting trains on the North Wales Coast Line to Chester, Crewe and London Euston. Dublin Connolly to Dublin Port can be reached via Amiens Street, Dublin into Store Street or by Luas via Busáras where Dublin Bus operates services to the Ferry Terminal. Dublin Airport (owned and operated by DAA) is located north of Dublin city, near Swords in the administrative county of Fingal. The headquarters of Ireland's flag carrier Aer Lingus and regional airlines Stobart Air and CityJet are located there, and those of low-cost carrier Ryanair nearby. The airport offers a short and medium haul network, domestic services to regional airports in Ireland, and long-haul services to the United States, Canada, the Middle East and Hong Kong. Dublin Airport is the 11th busiest in the European Union, and by far the busiest airport on the island of Ireland. In 2014, Dublin Airport was the 18th busiest airport in Europe, serving over 21 million passengers. By 2016 this increased to 27.9 million passengers passing through the airport, establishing an all-time record supported by growth in both short- and long-haul networks. In 2015 and 2016, transatlantic traffic grew, with 158 summer flights a week to North America, making it the sixth largest European hub for that route over the year. Transatlantic traffic was also the fastest-growing segment of the market for the airport in 2016, in which a 16% increase from 2015 brought the yearly number of passengers traveling between Dublin and North America to 2.9 million. From 2010 to 2016, Dublin Airport saw an increase of nearly 9.5 million passengers in its annual traffic, as the number of commercial aircraft movements has similarly followed a growth trend from 163,703 in 2013 to 191,233 in 2015. Dublin is one of the primary centres of education in Ireland, and is home to three universities, Dublin Institute of Technology and a number of other higher education institutions. There are 20 third-level institutes in the city and in surrounding towns and suburbs. Dublin was the European Capital of Science in 2012. The University of Dublin is the oldest university in Ireland, dating from the 16th century, and is located in the city centre. Its sole constituent college, Trinity College (TCD), was established by Royal Charter in 1592 under Elizabeth I. It was closed to Roman Catholics until Catholic Emancipation, and the Catholic hierarchy then banned Roman Catholics from attending until 1970. It is situated in the city centre, on College Green, and has 15,000 students. The National University of Ireland (NUI) has its seat in Dublin, which is also the location of the associated constituent university of University College Dublin (UCD), which has over 30,000 students. Founded in 1854, it is now the largest university in Ireland. UCD's main campus is at Belfield, about 5 km (3 mi) from the city centre, in the southeastern suburbs. Dublin City University (DCU), formerly the National Institute for Higher Education (NIHE) Dublin, offers courses in business, engineering, science, communication courses, languages and primary education. It has around 16,000 students, and its main campus is located about 7 km (4 mi) from the city centre, in the northern suburbs. Aside from the main Glasnevin Campus, the Drumcondra campus includes the former St Patrick's College of Education, now also hosting students from the nearby Mater Dei Institute and students from the Church of Ireland College of Education. The Royal College of Surgeons in Ireland (RCSI) conducts a medical school which is a recognised college of the NUI, and is situated at St. Stephen's Green in the city centre; there are also large medical schools within UCD and Trinity College. The National College of Art and Design (NCAD) provides education and research in art, design and media. The National College of Ireland (NCI) is also based in Dublin, as well as the Economic and Social Research Institute, a social science research institute, on Sir John Rogerson's Quay, and the Dublin Institute for Advanced Studies. Dublin is also home to the Royal Irish Academy, membership of which is considered Ireland's highest academic honour. The Institute of International and European Affairs is also in Dublin. Dublin Business School (DBS) is Ireland's largest private third level institution with over 9,000 students located on Aungier Street, and Griffith College Dublin has its main facility in Portobello. There are also smaller specialised colleges, including The Gaiety School of Acting and the New Media Technology College. The Irish public administration and management training centre has its base in Dublin, the Institute of Public Administration provides a range of undergraduate and post graduate awards via the National University of Ireland and in some instances, Queen's University Belfast. Outside of the city, the towns of Tallaght in South Dublin and Dún Laoghaire in Dún Laoghaire–Rathdown have technical colleges: Institute of Technology, Tallaght has full and part-time courses in a wide range of technical subjects and the Dún Laoghaire Institute of Art, Design and Technology (IADT) supports training and research in art, design, business, psychology and media technology. The western suburb of Blanchardstown offers a wide range of courses at the Institute of Technology, Blanchardstown. The City of Dublin is the area administered by Dublin City Council, but the term "Dublin" is also used to refer to the contiguous urban area which includes parts of the adjacent local authority areas of Dún Laoghaire–Rathdown, Fingal and South Dublin. Together, the four areas form the traditional County Dublin. This area is sometimes known as the Dublin Region. The population of the administrative area controlled by the City Council was 554,554 in the 2016 census, while the population of the urban area was 1,173,179. The County Dublin population was 1,273,069 and that of the Greater Dublin Area 1,904,806. The area's population is expanding rapidly, and it is estimated by the Central Statistics Office that it will reach 2.1 million by 2020. After World War Two, Italians were by far the largest immigrant group in both Dublin and Ireland and became synonymous with the catering and restaurant landscape. Since the late 1990s, Dublin has experienced a significant level of net immigration, with the greatest numbers coming from the European Union, especially the United Kingdom, Poland and Lithuania. There is also immigration from outside Europe, including from Brazil, India, the Philippines, China and Nigeria. Dublin is home to a greater proportion of newer arrivals than any other part of the country. Sixty percent of Ireland's Asian population lives in Dublin. Over 15% of Dublin's population was foreign-born in 2006. The capital attracts the largest proportion of non-Catholic migrants from other countries. Increased secularisation in Ireland has prompted a drop in regular Catholic church attendance in Dublin from over 90 percent in the mid-1970s down to 14 percent according to a 2011 survey. According to the 2016 census, the population of Dublin was 86.2% white (including 862,381 white Irish [86.2%], 132,846 other white [13.2%] and 5,092 [.5%] white Irish traveller), 2% black (23,892), and 4.6% Asian (46,626). Additionally, 2.7% (27,412) are from other ethnic or cultural background, while 4.9% (49,092) did not state their ethnicity. In terms of religion, 68.2% identified as Catholic, 12.7% as other stated religions, with 19.1% having no religion or no religion stated. As of July 2018[update], there were 1,367 families within the Dublin region living in homeless accommodation or other emergency housing. Dublin has a significant literary history, and produced many literary figures, including Nobel laureates William Butler Yeats, George Bernard Shaw and Samuel Beckett. Other influential writers and playwrights include Oscar Wilde, Jonathan Swift and the creator of Dracula, Bram Stoker. It is also the location of key and notable works of James Joyce, including Ulysses, which is set in Dublin and includes much topical detail. Dubliners is a collection of short stories by Joyce about incidents and typical characters of the city during the early 20th century. Other renowned writers include J. M. Synge, Seán O'Casey, Brendan Behan, Maeve Binchy, John Banville and Roddy Doyle. Ireland's biggest libraries and literary museums are found in Dublin, including the National Print Museum of Ireland and National Library of Ireland. In July 2010, Dublin was named as a UNESCO City of Literature, joining Edinburgh, Melbourne and Iowa City with the permanent title. Three branches of the National Museum of Ireland are located in Dublin: Archaeology in Kildare Street, Decorative Arts and History in Collins Barracks and Natural History in Merrion Street. The same area is also home to a number of smaller museums such as Number 29 on Fitzwilliam Street and the Little Museum of Dublin on St. Stephen's Green. Dublin is home to the National College of Art and Design, which dates from 1746, and Dublin Institute of Design, founded in 1991. Dublinia is a living history attraction showcasing the Viking and Medieval history of the city. Dublin has long had an 'underground' arts scene, with Temple Bar hosting artists in the 1980s, and spaces such as the Project Arts Centre acting as a hub for collectives and new exhibitions. The Guardian noted that Dublin's independent and underground arts flourished during the economic recession of c.2010. Dublin also has many dramatic, musical and operatic companies, including Festival Productions, Lyric Opera Productions, the Pioneers' Musical & Dramatic Society, the Glasnevin Musical Society, Second Age Theatre Company, Opera Theatre Company and Opera Ireland. Dublin has a vibrant nightlife and is reputedly one of Europe's most youthful cities, with an estimate of 50% of citizens being younger than 25. There are many pubs across the city centre, with the area around St. Stephen's Green and Grafton Street, especially Harcourt Street, Camden Street, Wexford Street and Leeson Street, the location of many nightclubs and pubs. The best known area for nightlife is Temple Bar, south of the River Liffey. The area has become popular among tourists, including stag and hen parties from Britain. It was developed as Dublin's cultural quarter and does retain this spirit as a centre for small arts productions, photographic and artists' studios, and in the form of street performers and small music venues. However, it has been criticised as overpriced, false and dirty by Lonely Planet. The areas around Leeson Street, Harcourt Street, South William Street and Camden/George's Street are popular nightlife spots for locals. The city retains a thriving market culture, despite new shopping developments and the loss of some traditional market sites. Amongst several historic locations, Moore Street remains one of the city's oldest trading districts. There has also been some growth in local farmers' markets and other markets. In 2007, Dublin Food Co-op relocated to a warehouse in The Liberties area, where it is home to market and community events. Suburban Dublin has several modern retail centres, including Dundrum Town Centre, Blanchardstown Centre, the Square in Tallaght, Liffey Valley Shopping Centre in Clondalkin, Omni Shopping Centre in Santry, Nutgrove Shopping Centre in Rathfarnham, and Swords Pavilions in Swords. Croke Park is the largest sport stadium in Ireland. The headquarters of the Gaelic Athletic Association, it has a capacity of 82,300. It is the third-largest stadium in Europe after Nou Camp in Barcelona and Wembley Stadium in London. It hosts the premier Gaelic football and hurling games, international rules football and irregularly other sporting and non-sporting events including concerts. Muhammad Ali fought there in 1972 and it played host to the opening and closing ceremonies of the 2003 Special Olympics. It also has conference and banqueting facilities. There is a GAA Museum there and tours of the stadium are offered, including a rooftop walk of the stadium. During the redevelopment of Lansdowne Road, Croke Park played host to the Irish Rugby Union Team and Republic of Ireland national football team as well as hosting the Heineken Cup rugby 2008–09 semi-final between Munster and Leinster which set a world record attendance for a club rugby match. The Dublin GAA team plays most of their home league hurling games at Parnell Park. I.R.F.U. Stadium Lansdowne Road was laid out in 1874. This was the venue for home games of both the Irish Rugby Union Team and the Republic of Ireland national football team. A joint venture between the Irish Rugby Football Union, the FAI and the Government, saw it redeveloped into a new state-of-the-art 50,000 seat Aviva Stadium, which opened in May 2010. Aviva Stadium hosted the 2011 UEFA Europa League Final. Rugby union team Leinster Rugby play their competitive home games in the RDS Arena & the Aviva Stadium while Donnybrook Stadium hosts their friendlies and A games, Ireland A and Women, Leinster Schools and Youths and the home club games of All Ireland League clubs Old Wesley and Bective Rangers. County Dublin is home for 13 of the senior rugby union clubs in Ireland including 5 of the 10 sides in the top division 1A. County Dublin is home to six League of Ireland association clubs; Bohemians F.C., Shamrock Rovers, St Patrick's Athletic, University College Dublin, Shelbourne and Cabinteely. The first Irish side to reach the group stages of a European competition (2011–12 UEFA Europa League group stage) are Shamrock Rovers, who play at Tallaght Stadium in South Dublin. Bohemian F.C play at Dalymount Park, the oldest football stadium in the country, and home ground for the Ireland football team from 1904 to 1990. St Patrick's Athletic play at Richmond Park; University College Dublin at the UCD Bowl in Dún Laoghaire–Rathdown; and Shelbourne at Tolka Park. Tolka Park, Dalymount Park, UCD Bowl and Tallaght Stadium, along with the Carlisle Grounds in Bray, hosted all Group 3 games in the intermediary round of the 2011 UEFA Regions' Cup. Dublin has two ODI cricket grounds in Castle Avenue, Clontarf and Malahide Cricket Club. The Castle Avenue hosted its first One Day International match on May 21, 1999 as part of the 1999 Cricket World Cup when Bangladesh played against the West Indies. College Park has Test status and played host to Ireland's first Test cricket match, a women's match against Pakistan in 2000. The men's Irish cricket team also played their first Test match against Pakistan at Malahide Cricket Club Ground during 2018. Leinster Lightning play their home inter-provincial matches in Dublin at College Park. The Dublin Marathon has been run since 1980 at the end of October, having been staged on the final Monday in October from 1980 to 2015, before moving to the final Sunday in 2016 and 2017. The Women's Mini Marathon has been run since 1983 on the first Monday in June, which is also a bank holiday in Ireland. It is said to be the largest all female event of its kind in the world. The Dublin area hosts greyhound racing at Shelbourne Park and horse racing at Leopardstown. The Dublin Horse Show takes place at the RDS, which hosted the Show Jumping World Championships in 1982. The national boxing arena is located in The National Stadium on the South Circular Road. The National Basketball Arena is located in Tallaght, is the home of the Irish basketball team, the venue for the basketball league finals, and has also hosted boxing and wrestling events. The National Aquatic Centre in Blanchardstown is Ireland's largest indoor water leisure facility. There are also Gaelic Handball, hockey and athletics stadia, most notably Morton Stadium in Santry, which held the athletics events of the 2003 Special Olympics. As of the 2018 Michelin Guide, five Dublin restaurants shared six Michelin stars – including Restaurant Patrick Guilbaud with two. Irish-born Kevin Thornton was awarded two Michelin stars in 2001 – though his restaurant, Thornton's, closed in 2016. The Dublin Institute of Technology commenced a bachelor's degree in culinary skills in 1999. Historically, Irish coffee house were associated with those working in media. Since the beginning of the 21st century, with the growth of apartment living in the city, Dublin's cafés attracted younger patrons looking for an informal gathering place and an ad hoc office. Cafés became more popular in the city, and Irish-owned coffee chains like Java Republic, Insomnia, and O'Brien's Sandwich Bars now compete internationally. In 2008, Irish barista Stephen Morrissey won the title of World Barista Champion. There are 12,950 students in the Dublin region attending 34 gaelscoileanna (Irish-language primary schools) and 10 gaelcholáistí (Irish-language secondary schools). Two Irish language radio stations Raidió Na Life and RTÉ Raidió na Gaeltachta have studios in the city, and the online and DAB station Raidió Rí-Rá broadcasts from studios in the city. A number of Irish language agencies are also located in the capital. Conradh na Gaeilge offers language classes, has a book shop and is a meeting place for different groups. The closest Gaeltacht to Dublin is the County Meath Gaeltacht of Ráth Cairn and Baile Ghib which is 55 km (34 mi) away. The city also has "co-operation agreements" with a number of other cities, and has previously proposed agreements with Rio de Janeiro and the Mexican city of Guadalajara. ^ "Dublin City Council, Dublin City Coat of Arms". Dublincity.ie. Retrieved 29 August 2015. ^ a b "Sapmap Area: County Dublin City". Census 2016. Central Statistics Office. 2016. ^ "Census of Population 2011" (PDF). Preliminary Results. Central Statistics Office. 30 June 2011. p. 21. Archived from the original (PDF) on 14 November 2012. Retrieved 25 May 2013. ^ "Census of Population 2011". Population Density and Area Size by Towns by Size, Census Year and Statistic. Central Statistics Office. April 2012. Retrieved 30 March 2014. ^ a b "Sapmap Area – NUTS III – Dublin Region". Census 2016. Central Statistics Office. 2016. Retrieved 16 January 2018. 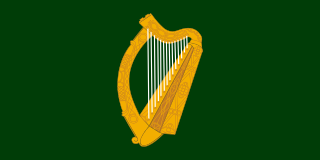 ^ "Dublin – Placename database of Ireland". Retrieved 15 January 2018. ^ "The Growth and Development of Dublin". Archived from the original (PDF) on 30 March 2013. Retrieved 30 December 2010. ^ "Primate City Definition and Examples". Retrieved 21 October 2009. ^ "Population Distribution – CSO – Central Statistics Office". Retrieved 4 February 2018. ^ a b Dickson, David (2014). Dublin The Making of a Capital City. Profile Books Ltd. pp. x. ISBN 978-0-674-74444-8. ^ "Global Financial Centres Index 8" (PDF). Archived from the original (PDF) on 11 October 2010. Retrieved 30 December 2010. ^ "The World According to GaWC 2018". Globalization and World Cities Research Network: Loughborough University. 13 November 2018. Retrieved 23 November 2018. ^ "Placenames Database of Ireland: Duibhlinn/Devlin". Retrieved 13 September 2013. ^ "Placenames Database of Ireland: Béal Duibhlinne/Ballydivlin". Retrieved 13 September 2013. ^ "Placenames Database of Ireland: Duibhlinn/Difflin". Retrieved 13 September 2013. ^ Clarke, Howard (1995). Medieval Dublin, the making of a metropolis. Irish Academic Press. p. 44. ISBN 978-0716524595. ^ Tambling, Jeremy (2017). The Palgrave Handbook of Literature and the City. Palgrave McMillan. p. 98. ISBN 978-1137549105. ^ Holder, Alfred (1896). Alt-celtischer sprachschatz (in German). Leipzig: B. G. Teubner. col.1393. Retrieved 7 November 2014. ^ a b Davies, Norman (1999). The Isles: a history. London: Macmillan. p. 1222. ISBN 978-0-333-76370-4. ^ a b Dickson, David (2014). Dublin The Making of a Capital City. Profile Books Ltd. p. 10. ISBN 978-0-674-74444-8. ^ Holm, Poul (1989). "The Slave Trade of Dublin, Ninth To Twelfth Centuries". Peritia. Journal of the Medieval Journal of Ireland: x. ^ a b "A Brief History of Dublin, Ireland". Dublin.info. Retrieved 19 August 2011. ^ "Fitzhenry, Meiler" . Dictionary of National Biography. London: Smith, Elder & Co. 1885–1900. ^ a b c "A Brief History of Dublin" (PDF). visitingdublin. Retrieved 19 August 2011. ^ Lyons, F.S.L. (1973). Ireland since the famine. Suffolk: Collins / Fontana. p. 880. ISBN 978-0-00-633200-8. ^ a b "Dublin Economic Monitor – October 2017". issuu. Retrieved 14 December 2017. ^ "Irish statute book, Local Government Provisional Order Confirmation Act, 1953". Irishstatutebook.ie. 28 March 1953. Retrieved 13 September 2013. ^ "Local Elections 2014". Dublin City Council. Archived from the original on 15 July 2014. Retrieved 13 July 2014. ^ "Constituency Commission Report 2012". Constituency Commission. Retrieved 22 July 2014. ^ "The TDs elected to the 32nd Dáil so far". Newstalk. Retrieved 12 May 2013. ^ a b "Dublin City Council: Facts about Dublin City". Dublin City Council. Archived from the original on 11 July 2014. Retrieved 8 July 2014. ^ "Final Characterisation Report" (PDF). Eastern River Basin District. Sec. 7: Characterisation of the Liffey Catchment Area. Retrieved 10 November 2014. ^ "Northside vs Southside". Wn.com. 25 February 2009. Retrieved 13 September 2013. ^ "Dublin – A Vibrant City – Quarters". VisitDublin.com. Retrieved 22 February 2017. ^ "Dublin launches new 'Creative Quarter' for city centre". TheJournal.ie. 11 March 2012. Retrieved 22 February 2017. ^ "Welcome to medieval quarter". Independent News & Media. 12 October 2006. Retrieved 22 February 2017. ^ "Dublin Town – Creative Quarter – DublinTown – What's On, Shopping & Events in Dublin City – Dublin Town". What's On, Shopping & Events in Dublin City – Dublin Town. Retrieved 13 November 2016. ^ "Temperature – Climate – Met Éireann – The Irish Meteorological Service Online". Met.ie. 2 January 1979. Retrieved 20 August 2010. ^ "Climatology details for station DUBLIN (RINGSEND), IRELAND and index RR: Precipitation sum". 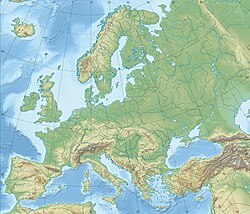 European Climate Assessment & Dataset. Retrieved 21 December 2012. ^ "Smoky coal ban". Department of Communications, Climate Action and Environment. Retrieved 1 January 2018. ^ a b "How the coal ban dealt with Dublin's burning issue". Irish Times. 26 September 2015. Retrieved 22 February 2017. ^ Clancy, L.; Goodman, P.; Sinclair, H; Dockery, D. (2002). "Effect of air-pollution on death rates in Dublin Ireland: an intervention study". The Lancet. 360 (9341): 1210–1214. doi:10.1016/S0140-6736(02)11281-5. PMID 12401247. ^ "Casement Airport 1981–2010 averages". Met Éireann. Retrieved 13 October 2016. ^ a b c "Absolute Maximum Air Temperatures for each Month at Selected Stations" (PDF). Met Éireann. Archived from the original (PDF) on 4 March 2016. Retrieved 13 October 2016. ^ a b c "Absolute Minimum Air Temperatures for each Month at Selected Stations" (PDF). Met Éireann. Archived from the original (PDF) on 29 January 2017. Retrieved 13 October 2016. ^ "Dublin Airport 1981–2010 averages". Met Éireann. Retrieved 13 October 2016. ^ "Climatological Information for Merrion Square, Ireland". European Climate Assessment & Dataset. Archived from the original on 9 July 2018. Retrieved 8 July 2018. ^ "Dublin, Ireland – Monthly weather forecast and Climate data". Weather Atlas. Retrieved 25 January 2019. ^ McCarthy, Denis; Benton, David (2004). Dublin Castle: at the heart of Irish History. Dublin: Irish Government Stationery Office. pp. 12–18. ISBN 978-0-7557-1975-4. ^ "Spire cleaners get prime view of city". Irish Independent. 5 June 2007. Retrieved 5 June 2007. ^ "The Dublin Spire". Archiseek. 2003. Retrieved 20 October 2011. ^ "Guinness Storehouse tops list of most visited attractions". Irish Times. 26 July 2013. ^ "Some Famous Landmarks of Dublin – Dublin Hotels & Travel Guide". Traveldir.org. 8 March 1966. Retrieved 16 September 2011. ^ "Dublin City Parks". Dublin City Council. Retrieved 1 September 2015. ^ It is larger than all of London's city parks put together, and more than twice the area of New York's Central Park. "The Phoenix Park Visitor Guide" (PDF). Office of Public Works. Retrieved 1 January 2018. ^ "Outline History of Áras an Uachtaráin". Áras an Uachtaráin. Retrieved 7 January 2013. ^ "Richest cities in the world by purchasing power in 2009". City Mayors. Retrieved 17 June 2010. ^ "Richest cities in the world by personal earnings in 2009". Citymayors.com. 22 August 2009. Retrieved 17 June 2010. ^ "Dublin falls in city-cost rankings". Irish Times. 12 July 2011. Retrieved 20 July 2011. ^ "About Dublin. Economic Activity, Tax & Employment". Dublin Chamber. Retrieved 12 November 2018. ^ "I.F.S.C". I.F.S.C.ie. 21 June 2010. Retrieved 21 January 2010. ^ "Monitor: Dublin unemployment falls to lowest level in 10 years amid economic resurgence". Retrieved 2 August 2018. ^ "14th issue of the Dublin Economic Monitor". Retrieved 1 August 2018. ^ "E-Flow Website". eFlow. Retrieved 29 July 2011. ^ Kelpie, Colm (23 March 2016). "Revealed: Dublin ranked worse than London or Paris for road congestion". The Irish Independent. Retrieved 20 December 2016. ^ "TomTom Traffic Index". TomTom. Retrieved 20 December 2016. ^ "Report on trends in mode share of vehicles and people crossing the Canal Cordon 2006 to 2013" (PDF). Dublin City Council & National Transport Authority. 2013. pp. 4, 8, 16. Archived from the original (PDF) on 3 September 2015. Retrieved 29 August 2015. ^ "Cycling Maps". Dublincitycycling.ie. Retrieved 13 September 2013. ^ "Copenhagenize Consulting – Copenhagenize Index of Bicycle-Friendly Cities 2011". Copenhagenize.eu. Retrieved 13 September 2013. ^ "Copenhagenize Consulting – Copenhagenize Index of Bicycle-Friendly Cities 2011". Copenhagenize.eu. Retrieved 3 July 2017. ^ "Copenhagenize Consulting – Copenhagenize Index of Bicycle-Friendly Cities 2017". Copenhagenize.eu. Retrieved 12 February 2019. ^ "Dublinbikes – How does it work?". Dublinbikes. Retrieved 29 July 2011. ^ "Dublinbikes – latest figures". Dublinbikes.ie. 21 August 2018. Retrieved 3 October 2018. ^ "Dublinbikes Strategic Planning Framework 2011–2016" (PDF). Dublin City Council. Archived from the original (PDF) on 14 January 2012. Retrieved 29 July 2011. ^ "DART (Dublin Area Rapid Transit)". Archived from the original on 21 July 2011. Retrieved 28 July 2011. ^ "Passenger Journeys by Rail by Type of Journey and Year – StatBank – data and statistics". Retrieved 20 April 2016. ^ a b "Luas – Frequently Asked Questions". luas.ie. Retrieved 1 January 2018. ^ "Luas Cross City Opened". Luas.ie. Transdev. December 2017. Retrieved 14 December 2017. ^ Melia, Paul (22 March 2018). "Revealed: Preferred route for €3bn MetroLink from city centre to Dublin Airport unveiled". Irish Independent. Retrieved 12 November 2018. ^ "53 – Dublin Bus". dublinbus.ie. ^ "2017 Year in Review". Dublin Airport. Retrieved 3 October 2018. ^ Bodkin, Peter. "Take a look inside the 10 busiest airports in Europe". TheJournal.ie. Retrieved 1 February 2017. ^ a b c "Record 2016 For Dublin Airport With Almost 28M Passengers". www.dublinairport.com. Retrieved 1 February 2017. ^ "Dublin Airport flying high after record year for transatlantic traffic – Independent.ie". Independent.ie. Retrieved 1 February 2017. ^ "Flight Statistics 1998 – 2014". Irish Aviation Authority. 11 April 2016. Archived from the original on 11 April 2016. Retrieved 1 February 2017. ^ "ESOF Dublin". EuroScience. 2012. Archived from the original on 8 September 2015. Retrieved 29 August 2015. ^ Walshe, John; Reigel, Ralph (25 November 2008). "Celebrations and hard work begin after capital lands science 'Olympics' for 2012". Irish Independent. Retrieved 17 June 2010. ^ "DCU incorporation of CICE, St Pats and Mater Dei". DCU. 2014. Archived from the original on 18 April 2016. Retrieved 5 May 2016. ^ "Census 2016 -Non-Irish Nationalities Living in Ireland". Cso.ie. Retrieved 18 September 2018. ^ "Call for improved infrastructure for Dublin". rte.ie. RTÉ. 2 April 2007. ^ "RTÉ Archives | Society | The Italians". rte.ie. RTÉ. Retrieved 14 August 2018. ^ "Dublin heralds a new era in publishing for immigrants". The Guardian 12 March 2006. ^ "Foreign nationals now 10% of Irish population". rte.ie. RTÉ. 26 July 2007. ^ "Census 2016 Sapmap Area: Settlements Dublin City And Suburbs. Usually resident population by ethnic or cultural background". Central Statistics Office. Retrieved 12 November 2018. ^ "Census 2016 Sapmap Area: Settlements Dublin City And Suburbs. Population by religion". Central Statistics Office. Retrieved 12 November 2018. ^ "Dublin Region Families who are Homeless July 2018 (Week Of 23rd–29th)" (PDF). homelessdublin.ie. Dublin Region Homeless Executive. July 2018. Retrieved 13 September 2018. ^ Irish Independent – Delight at City of Literature accolade for Dublin. Retrieved 26 July 2010. ^ "National Museum of Ireland". Museum.ie. 8 June 2010. Retrieved 17 June 2010. ^ Conway, Richard (22 November 2010). "Dublin's independent arts scene is a silver lining in the recession-hit city". The Guardian. London. ^ "RTÉ report on World Design Capital shortlist". RTÉ News. 21 June 2011. Retrieved 14 January 2012. ^ McDonald, Frank (22 June 2011). "Dublin on shortlist to be 'World Design Capital'". Irish Times. Retrieved 14 January 2012. ^ "The Irish Experience". The Irish Experience. Retrieved 17 June 2010. ^ "Dublin Guide, Tourist Information, Travel Planning, Tours, Sightseeing, Attractions, Things to Do". TalkingCities.co.uk. 6 October 2009. Archived from the original on 6 October 2009. Retrieved 6 October 2009. ^ Article on stag/hen parties in Edinburgh, Scotland (which mentions their popularity in Dublin), mentioning Dublin. Retrieved 15 February 2009. ^ "New Lonely Planet guide slams Ireland for being too modern, Ireland Vacations". IrishCentral. Retrieved 17 June 2010. ^ Doyle, Kevin (17 December 2009). "Let us open up for Sunday shoppers says Moore Street". The Herald. Retrieved 28 December 2009. ^ McKenna, John (7 July 2007). "Public appetite for real food". The Irish Times. Retrieved 28 December 2009. ^ Van Kampen, Sinead (21 September 2009). "Miss Thrifty: Death to the shopping centre!". The Irish Independent. Retrieved 28 December 2009. ^ Mooney, Sinead (7 July 2007). "Food Shorts". The Irish Times. Retrieved 28 December 2009. ^ "Croke Park Stadium". Crokepark.ie. Retrieved 13 October 2016. ^ "World record crowd watches Harlequins sink Saracens". The Sydney Morning Herald. 1 April 2012. Retrieved 27 April 2012. ^ "Taoiseach Officially Opens Aviva Stadium". IrishRugby.ie. 14 May 2010. Retrieved 29 August 2015. ^ "Homepage of Lansdowne Road Development Company (IRFU and FAI JV)". Lrsdc.Ie. Archived from the original on 18 May 2016. Retrieved 17 June 2010. ^ "Ireland Women v Pakistan Women, 2000, Only Test". CricketArchive. Retrieved 5 September 2013. ^ "Pakistan Confirmed as Ireland's First Test Opponents". cricketireland.ie. Retrieved 28 August 2018. ^ "College Park to become Lightning home ground". CricketEurope. Retrieved 15 April 2019. ^ "History". VHI Women's Mini Marathon. 2015. Archived from the original on 15 October 2015. Retrieved 29 August 2015. ^ "Full list of Michelin-starred restaurants in Ireland in the 2018 guide". Joe.ie. 2 October 2017. Retrieved 17 June 2018. ^ "The Changing Geography and Fortunes of Dublin's Haute Cuisine Restaurants, 1958–2008". Food, Culture and Society: An International Journal of Multidisiplinary Research. 14 (4, pp. 525–545). ^ a b Máirtín Mac Con Iomaire. "Coffee Culture in Dublin: A Brief History". M/C Journal. 2012, Vol. 15 Issue 2. ^ "Full of beans: meet Stephen, the world's best barista". Irish Independent. 15 July 2008. ^ "Education through the Medium of Irish 2015/2016" (PDF). gaelscoileanna.ie. 2016. Retrieved 1 January 2018. ^ a b "Dublin City Council: International Relations Unit". Dublin City Council. Retrieved 8 July 2014. ^ "Sister City Program". City of San José. 19 June 2013. Retrieved 8 July 2014. ^ "Liverpool City Council twinning". Liverpool.gov.uk. 17 November 2008. Archived from the original on 6 July 2010. Retrieved 23 June 2009. ^ "Ciutats agermanades, Relacions bilaterals, L'acció exterior". CIty of Barcelona. 18 June 2009. Archived from the original on 29 April 2010. Retrieved 23 June 2009. ^ "Barcelona City Council signs cooperation agreements with Dublin, Seoul, Buenos Aires and Hong Kong". Ajuntament de Barcelona. 26 November 2012. Retrieved 29 August 2015. ^ "Dublin signs twinning agreement with Beijing". Dublin City Council. 2 June 2011. Retrieved 11 February 2012. County Wicklow is a county in Ireland. The last of the traditional 32 counties to be formed, as late as 1606, it is part of the Mid-East Region and is also located in the province of Leinster. It is named after the town of Wicklow, which derives from the Old Norse name Víkingaló, which means "Vikings' Meadow". Wicklow County Council is the local authority for the county. The population of the county was 142,425 at the 2016 census. Limerick is a city in County Limerick, Ireland. It is located in the Mid-West Region and is also part of the province of Munster. Limerick City and County Council is the local authority for the city. The city lies on the River Shannon, with the historic core of the city located on King's Island, which is bounded by the Shannon and the Abbey River. Limerick is also located at the head of the Shannon Estuary where the river widens before it flows into the Atlantic Ocean. With a population of 94,192, Limerick is the third most populous urban area in the state, and the fourth most populous city on the island of Ireland. Leinster is one of the Provinces of Ireland situated in the east of Ireland. It comprises the ancient Kingdoms of Mide, Osraige and Leinster. Following the 12th-century Norman invasion of Ireland, the historic fifths of Leinster and Mide gradually merged, mainly due to the impact of the Pale, which straddled both, thereby forming the present-day province of Leinster. The ancient kingdoms were shired into a number of counties for administrative and judicial purposes. In later centuries, local government legislation has seen further sub-division of the historic counties. Port Laoise, or Portlaoise is the county town of County Laois, Ireland. It is located in the South Midlands in the province of Leinster. The 2016 census shows that the town's population increased by 9.5% to 22,050, which is well above the national average of 3.8%. It is the most populous and also the most densely populated town in the Midlands Region, which has a total population of 292,301 at the 2016 census. This also makes it the fastest growing of the top 20 largest towns and cities in Ireland. 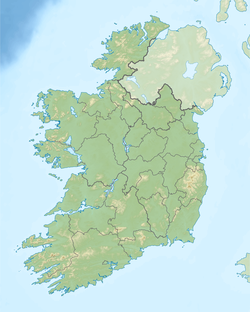 South Dublin is a county in Ireland, within the province of Leinster, and the Dublin Region, a successor to County Dublin, from which its name derives. South Dublin County Council is the local authority for the county. The county contains both dense suburbs of Dublin and stretches of unpopulated mountain. In 2011 it had a population of 278,749, making it the third most populous county in the state. Dún Laoghaire–Rathdown is a county in Ireland. It is part of the Dublin Region in the province of Leinster. It is named after the former borough of Dún Laoghaire and the barony of Rathdown. Dún Laoghaire–Rathdown County Council is the local authority for the county. The population of the county was 218,018 at the time of the 2016 census. Maynooth is a university town in north County Kildare, Ireland. It is home to Maynooth University and St Patrick's College, a Pontifical University and Ireland's main Roman Catholic seminary. Maynooth is also the seat of the Irish Catholic Bishops' Conference and holds the headquarters of Ireland's largest development charity, Trócaire. Maynooth is located 24 kilometres west of central Dublin. Ringsend is a southside inner suburb of Dublin, Ireland. It is located on the south bank of the River Liffey and east of the River Dodder, about two kilometres east of the city centre. It is the southern terminus of the East Link Toll Bridge. Areas included in Ringsend are the south side of the Dublin Docklands, and at the west end is the area of South Lotts and part of the Grand Canal Dock area. Neighbouring areas include Irishtown, Sandymount and the Beggars Bush part of Ballsbridge to the south, and the city centre to the west. Key feature of the area are the chimneys of Poolbeg power station. Clondalkin is a suburban town situated 10 km west of Dublin city centre, Ireland, under the administrative jurisdiction of South Dublin. Newbridge, officially known by its Irish name Droichead Nua, is a town in County Kildare, Ireland. While the nearby Great Connell Priory was founded in the 13th century, the town itself formed from the 18th century onwards, and grew rapidly alongside a military barracks which opened in the early 19th century. Taking on the name Newbridge in the 20th century, the town expanded to support the local catchment, and also as a commuter town for Dublin. Doubling in population during the 20 years between 1991 and 2011, its population of 22,742 in 2016 makes it the largest town in Kildare and the fifteenth-largest in Ireland. Castleknock is a large residential outer suburb of Dublin, centred on a village, in Fingal, Ireland. It is located 8 km (5 mi) west of the centre of Dublin. Blessington, historically known as Ballycomeen, is a town on the River Liffey in Wicklow, Ireland, near the border with Kildare. It is around 25 km south-west of Dublin, and is situated on the N81 road, which connects Dublin to Tullow. Inishbiggle is a small inhabited island off the coast of Ballycroy in Co. Mayo. Its name in Irish means "Vigil Island"
Leixlip is a town in north-east County Kildare, Ireland, near Dublin. Its location on the confluence of the River Liffey and the Rye Water has marked it as a frontier town historically: on the border between the ancient kingdoms of Leinster and Brega, as an outpost of The Pale, and on Kildare's border with County Dublin. Dún Laoghaire is a suburban coastal town in County Dublin, Ireland, about 12 km south of Dublin city centre. It is the county town of Dún Laoghaire–Rathdown. Formerly a major port of entry from Great Britain, it was known as Dunleary until 1821 when it was renamed Kingstown in honour of King George IV's visit that year, and in 1920 was given its present name, the original Irish form of Dunleary. The Mid-West Region is a NUTS Level III statistical region of Ireland. The region comprises the territory of Limerick City, the regional capital, as well as the counties of Limerick, Clare and Tipperary. It spans 10,511 km², 14.95% of the total area of the state and had a 2016 population of 473,269.